You may have noticed from the last email, we are proposing a revolutionary new concept. To use the five-character (5) TCS ID to simplify color naming. Since the first 2 characters is an abbreviation of a color family, the reader immediately recognizes and visualizes the color. This will bring up a screen with all 15 new colors displayed. Thank You for being our customer and any help you can give us is appreciated. You may have read that we are encouraging artists, teachers, publishers and paint brands to use and print the TCS Identifier in their work. The reason is simplicity, less frustration between color names and ease in recognizing the color. The first two characters of the TCS ID is the color family. Blue Green is BG, Yellow is YE and Green is GR etc. There are 15 color families. The reader can automatically visualize the color in their minds eye. No more mystery or confusion about the color name and its color family. The third character is the “Hue” of the color. It is a number between 1 and 9. For instance, on the TCS Digital Color Wheel five (5) is a prefect Green. It has no blue and no yellow in it. Working around the color wheel, GR numbers 4, 3, 2, 1 will be tints of blue becoming more obvious until it becomes blue green, BG. Numbers 6, 7, 8, 9 will be increasing amounts of yellow until it becomes YG yellow green. 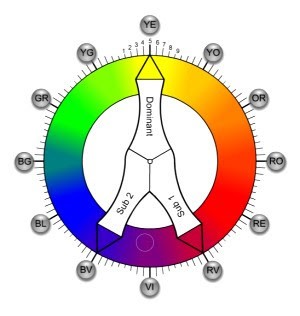 You can view the entire TCS Digital Color Wheel, and all 135 color hues, in the eBook "Treasury of Tips and Techniques for the Decorative Artist". It can be downloaded when ordered from our Facebook site TCS / Tru-Color Systems. The cost is $2.99. We encourage you to write your comments, Pro or Con, about this concept on Facebook. For your convenience you can use the link at the bottom of the newsletter. The major benefit of searching only on the color Hue is that you get dozens of additional close choices from which to choose, including exact color matches. This is explained in more depth the Tips eBook. Search Google, or any service, for: Free Kindle app for (your Device). That will get you to the app you need to download. Yes, I have been told “I still like a book in my hands”. We all felt that way originally. Today, my Kindle library is 825 eBooks. Why? eBooks are specialized to subject matter and very cost effective. I read them on my iPad or iPhone. Books at my finger-tips always! Thank You for your positive response. Please encourage and help your painting friends get it set up on their systems. More benefits to follow in future newsletters. Attention Plaid Folk Art Users: We are in need of color swatches for some Folk Art colors. If you are willing to help us, go to www.colorconversions.com and then click on “Members” and read “Color Swatch Sample Cards”. We would appreciate your help. Recently, a 10 year user of TCS Color Match told me she did not want to do all the typing of color names to enter her inventory of colors. I explained all she needed to do was click the selected color names and enter the quantity, she did it and now has the advantage of viewing the colors she owns each time she makes a color match. It is easy and painless. IF You Are Not Using The Inventory Benefit of Your TCS Color Match - WHY NOT? See Inventory Options Window: Click link ==> View/Print Only ==> All Brands. Now view: Full Inventory in header ==> click "Print" link. When printing is completed click "Back to Inventory" link. While on the Inventory Options window, you can see link View/Print Shopping List (Qty=0). This will print only colors with (0) zero quantity For your shopping List. In fifteen years of operation, I do not know of a single user losing their inventory, this is only for a "Safety Precaution". ASSISTANTS NEEDED! Each summer we try to review each brand for changes. We look for new colors, discontinued colors etc. of each brand. We compare our colors list verses their colors listed on their web pages. If you have 3/4 of an hour to help us with this task, send us your name. I will reply with additional instructions. With great appreciation and thanks for your help and loyalty as a TCS supporter! Help us "spread the word". Grassroots support is convincing. We are in the process of changing our billing system. We are removing the requirement of sending your credit card information to us. We now have a business account with PayPal and we will send you a renewal notification each year and they will process your credit card which is more secure for everyone. The new billing system will email you a notification. That renewal date is visible in the lower right corner of the TCS Home screen after you have logged in. We have a single rate for membership which is $25.00 for 1 year. It may be time for your membership renewal... $25 for one year. Just wait for an e-mail invoice from us / PayPal in the month of your renewal. You do not need to create a PayPal account. You pay the invoice with your Credit Card. There is no charge to you, we pay the fee. If you prefer you can mail us a personal check or Money Order made out to Tru-Color Systems. Let us know how you get along. We would appreciate your feedback. If you have questions or comments, Please do not hesitate to contact us. Neal Pearcy, tcscolor@gmail.com .